Most businesses can make cost-savings through reducing their energy consumption. 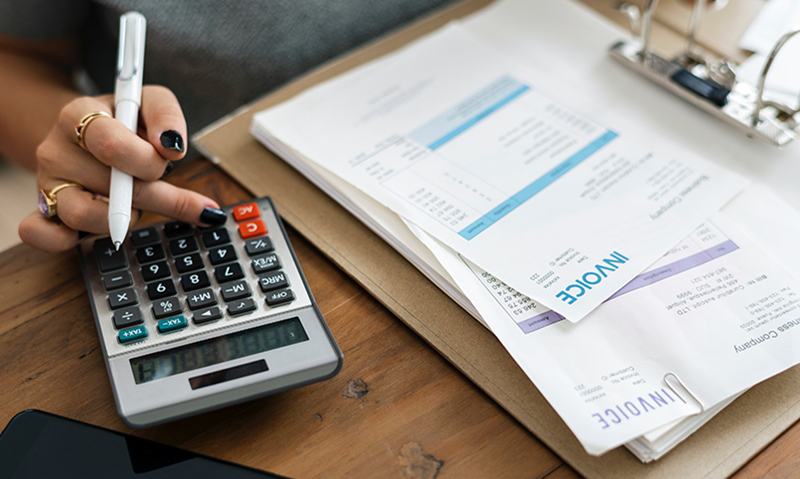 Research shows that a 20% cut in energy costs represents the same bottom line benefit as a 5% increase in sales in many businesses (Carbon Trust). Becoming more energy efficient not only saves you money, but it can also benefit your business’s working environment and enhance your corporate reputation. The below pie chart highlights the top contributors to business energy consumption (Carbon Trust). 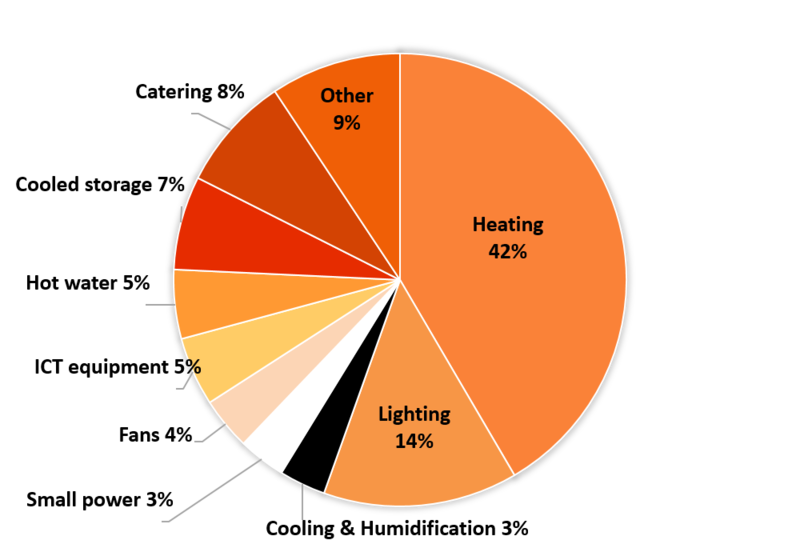 Breakdown of energy consumption by end uses in non-domestic buildings in 2014-2015. Heating and lighting are the two largest sources of business energy consumption, so these are a great place to start. There are lots of small changes you can implement around your business premises to decrease your use of heating and lighting. Install energy efficient bulbs: LED lights are 6-7 times more energy efficient than traditional bulbs as they use 90% less energy (Source: Which). They use less electricity and last much longer, meaning that although you may need to pay more for the bulb, you’ll quickly see the return on investment on your energy bills. Ensure your boilers are serviced at least annually: A poorly operated or maintained boiler can increase your heating costs by 30% or more (Carbon Trust). Bigger isn’t always better: When changing your boiler, it’s important to install the right sized boiler for your business. Boilers that are oversized will never reach their full potential as they’re always running a part load. Insulate the workplace: Install double glazing on windows, free-swing doors and draft excluders around windows and doors. These can all reduce drafts, and in turn reduce your heating bill. Throughout the year, the seasons change, and daylight hours and temperatures change with it. Businesses must make seasonal changes to their behaviour and working environment in order to reduce energy waste and create a comfortable working space for their employees. Use daylight when you can: During summer months the days are much longer, so keep blinds open and windows free of obstruction to use as much natural light as possible. Put timers on lights: If rooms aren’t being used, then timers on lights can save electricity from being wasted. Fit light sensors with automatic dimmers: These lower the level of artificial light in a room if there is already enough daylight, saving you energy. Programme thermostats so you are only using heating when needed: Review this each time the clocks change to ensure you’re being energy efficient and not wasting heating. For every 1 degree of overheating, these costs rise by 8% (Carbon Trust). Whether its computers or other machinery, workplace equipment can contribute to a large proportion of your energy consumption. Turn everything OFF: Even when your equipment is left on standby, you’re still using energy. Turn all your appliances off at the socket so you don’t consume more energy than required. Let your PC snooze: Enable the auto-sleep mode if it’s unused for more than 10 minutes. Turn screensavers off: Screensavers actually waste more energy than you think. Use a black screen or no screensaver at all to become more energy efficient. Check multi-sockets: Remove any plugs that are plugged into multi-sockets but not in use. Go paperless: Save printing and photocopying costs by going paperless, this can help you become much more energy efficient and save some trees too! Whether you just have a small fridge for employee’s lunches or you have a large work canteen, it’s important to ensure you and your employees aren’t wasting energy when you don’t need to be. Buy energy efficient appliances: When buying new equipment, always look out for the energy star rating. These can reduce your energy consumption considerably, especially if they are used a lot. Don’t over boil: When boiling the kettle, only use as much water as needed. Kettles can be an expensive appliance to run so try and prevent employees boiling the kettle again when has already boiled. Don’t leave fridge/freezer doors open: By leaving the door open, heat can enter the appliance and makes the appliance work much harder to maintain its temperature. Position chilled cabinets away from external doors: In the summer months this can decrease your energy efficiency. Don’t waste water: Install self-closing taps and flow restrictors so that there isn’t any chance an employee can leave one on accidentally. Maintaining good housekeeping can save your business a lot of wasted energy. Keep doors closed: Closing doors stops heat escaping or cold air entering a room. Use easy to fit door closers and install gap fillers around doors. Keep heat sources clear: Placing items in front of heaters, radiators and air vents can obstruct heat output and stop the room being adequately heated. Switch lights off: When leaving a room make sure you switch lights off. There is no point lighting a room when nobody is in it. One of the most important things do is to educate your employees. There is no point putting new regulations and energy efficiency goals in place if your employees are not committed to helping you achieve them. Educate your employees: Train them on environmental issues, energy management and individual ways that they can help the environment. Place posters and stickers around the workplace: This will help to improve awareness of energy efficiency. The more awareness they have, the more they will feel a part of the bigger picture. Set clear efficiency goals: Incentivise and reward employees for their positive behaviour. They will then have an incentive to maintain the behaviour and it will become an internal company culture of energy saving. Finding out more about your energy consumption can be the first port of call for most businesses. Conduct a business energy audit: These help you to identify where energy is being wasted so you can prioritise changes. You can call in a professional auditor to get a detailed report of your energy consumption. Install a smart meter: Smart meters with smart energy displays allow you to see how much energy you’re using at any given time. You can monitor how much energy you’re using and identify energy wasting behaviours to help you become more energy efficient. We’ll soon be rolling out our SMETS2 smart meters for small and medium-sized businesses. For many eligible businesses, this is free of charge. If you’d like to know more, then please register your interest via email to smartmeters@yuenergy.co.uk and a member of our team will be in contact with you.